Tired of old-school, fussy control panels? My20i offers a simple and elegant alternative. Manage domains, websites, databases, email accounts, and more from our powerful, modern user interface. From the start, our team were focused on designing the ultimate web hosting control panel. Decades of hosting experience – combined with customer feedback – gave us that ambition. But it wasn’t easy. We had to create something new, but not too new! It still had to be familiar enough that an inexperienced user would understand it intuitively. We didn’t want users to be overwhelmed by too many options. It also had to be responsive, attractive and cohesive. It needed to be a pleasure to use, not a chore. We think we were successful. My20i has been described as ‘not only beautiful, but fully functional’. It’s easy to navigate, puts everyday tasks right at your fingertips and is supported by a host of reference articles. Like a successful website, it puts user experience first. Also like the best sites, we’re not leaving it there: based on user data and feedback, we’re working to make it better all the time. My20i makes finding features hassle-free. Touch-focused icons, drop-down menus, a quick-add menu and a powerful search bar offer a range of options to get you where you need, fast. Our aim is to make the task of managing hosting – which we know can be pretty dull – as pain-free as possible! Control all your hosting from one place. It includes a complete file manager, SSH access, comprehensive stats and logs, FTP and email account management, 70+ one-click installs, and much more. Control everything quickly and easily: from the version of PHP you use, to the cron jobs you run. If you’re a WordPress user, My20i includes a wealth of features in its WordPress Tools menu. You can create staging sites in one click, and manage users, themes, plugins and more, all from a dashboard within our control panel. Plus it’s secure. Get peace of mind by setting-up two-factor authentication on logins and SSH access to give you an extra level of security. Other control panels can be slow and unwieldy if you’re trying to make changes from a beach somewhere…not so with ours! You can manage and update your settings using any device. Our control panel menu adapts to your screen size, and it’s optimised to be fast and lightweight. It all makes My20i a frustration-free experience, on a phone, tablet or desktop, whatever your bandwidth. 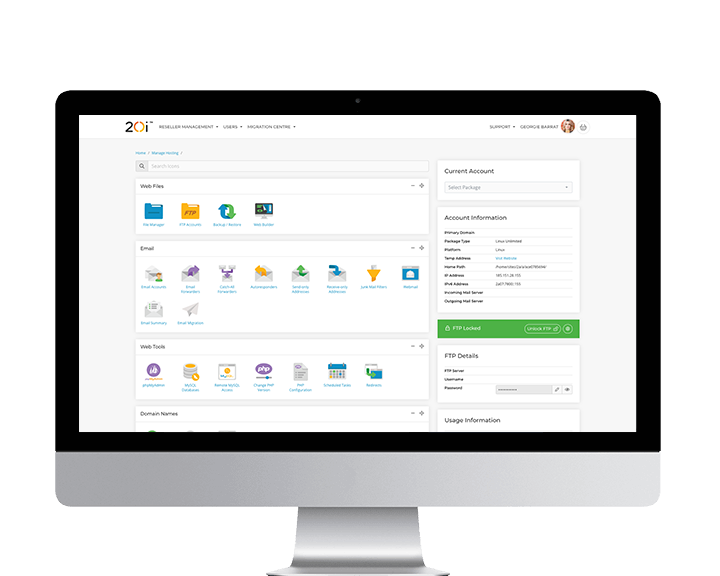 My20i’s sleek, user-friendly design is a step ahead of other web hosting control panels. Not only is it easy to use, you’ll want to use it. "20i has been the most productive platform I have worked on yet. Everything is where it is supposed to be, easy to find and easy to use. I waste no time at all when working on My20i." Whether you’re running a business a small personal blog, your control panel shouldn’t be a barrier to getting things done efficiently. You shouldn’t have to resort to third-party tools. My20i.com is included with all of our hosting services. 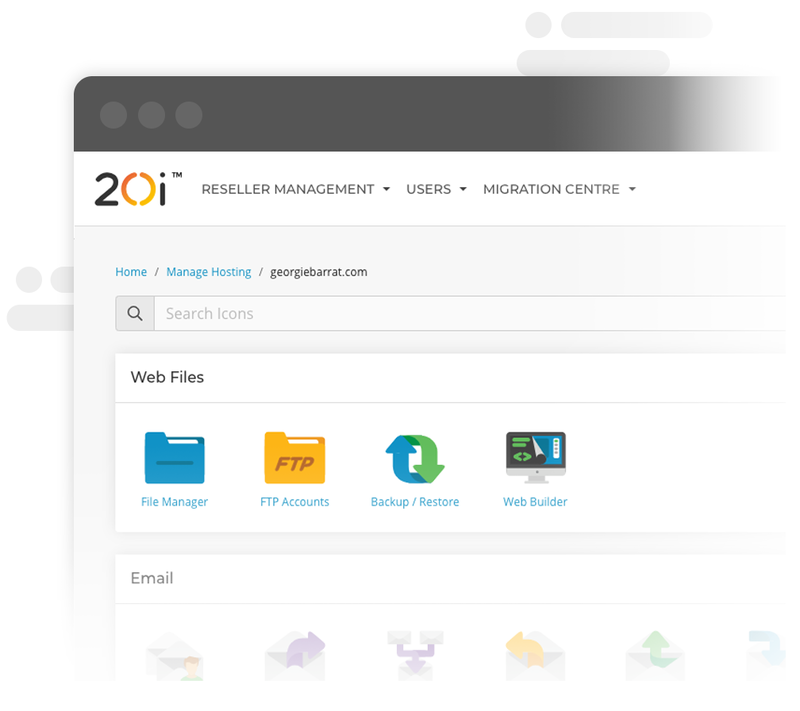 Join 20i today from just £1, on our Reseller Hosting, WordPress Hosting or Web Hosting plans.